I am never really a fan of when movie producers adapt a musical for film, but today I learned that a certain “popular” musical is headed for the big screen and I couldn’t help but feel a little excitement. Yes, ladies and gents, the Tony award winning show Wicked is being made into a movie! Composer Stephen Schwartz has decided to take on this challenge, musing to the folks at Vulture, “What are we going to change? What are we going to keep? How do you use a whole new language and medium to tell the story? We can really look at it again and say, ‘Oh, we can do this, and we’ve always wanted to do that and we couldn’t onstage, but we can in a movie.’” Exciting and scary at the same time! Rumors as of this morning are that with the success of Les Mis, Wicked is on the fast track, in Hollywood terms anyway. My fingers are crossed in hopes that the movie version doesn’t change too much. The actors for the movie have not been cast as yet, so the fan base is curiously buzzing. Sadly Chenoweth and Menzel are reportedly said to be too old for this Hollywood version—so disappointing. Anyway, I’ve been giving this some thought and I think Kristin Bell might make a great Galinda, and Justin Bieber could TOTALLY pull off the Chistery (Hah! That’s the flying monkey). The internet rumor is that Fiyero is to be played by Harry Styles… which to me sounds like they are planning to turn Wicked into one of those movies where all I can think to say is… Loathing! Unadulterated loathing! 😉 What are your thoughts on this wickedly curious production? 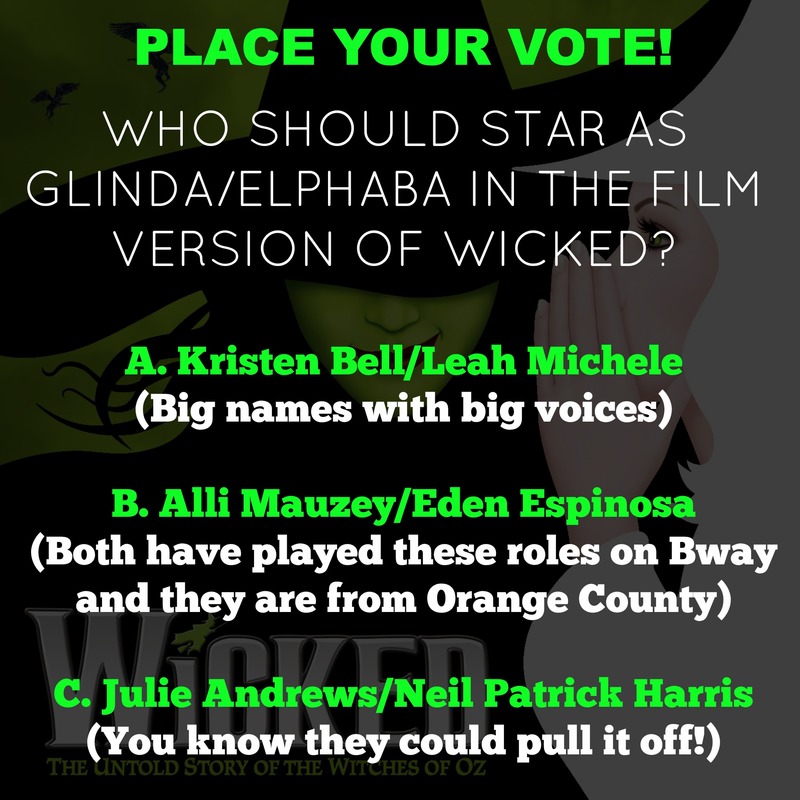 Who do you think would best bring Wicked to life on the big screen?